"A Solid Product Which Makes Dating Science 'Down to Earth' and Accessible"
A good grounding programme for beginners. It has everything you need. It will be best for those of you who are good studiers (because there are a fair number of concepts introduced). If you've read one or two pieces of dating advice already and feel a bit more at home with terminology, this could also be a good product for you. Overall - it's a good solid product. This is a program which is pretty comprehensive in covering everything about meeting, attracting and dating women. It should be thought of as a 'Dating Manual' with the foundations of what you need to know to get good. It is basically "The Social Man"'s explanation of dating science. I see this as a product which is a little between total beginners and intermediates. On the one hand it's comprehensive. Everything is in there to give a beginner a good foundation in dating science. And it attempts to stick to the most important things to start to get good from scratch. The tone of conversation from Christian Hudson and Nick Sparks throughout is focused on helping the beginner. On the other hand the fact that it is so comprehensive, means that some aspects are a little rushed through - and could become confusing for a beginner. Example in hand - in Part 4 of the videos there are ALOT of concepts and terms introduced in particular. It feels like waves and wave of them and gets too much for a beginner IMHO. Newbies may feel they are drowning in concepts and some technical language on that video. What do I mean by "Down to Earth"? Christian and Nick have obviously made big efforts in everything from the words they use to the way they have structured the advice to make it more accessible to the every day guy. They use a lot of common words and terminology for example to explain things. They provide examples throughout about the concepts they are talking to, and use some helpful visual diagrams to get the more complex points across. So, given how much ground they cover in the product - I'd give it an A+ in terms of how they've tried to simplify it, and keep it as uncomplicated as possible. Really good effort. When I finished watching this program I couldn't help thinking of many other products that I've reviewed. The majority of content has been taken from many of the best products, and common community knowledge, that has been developed up till it's creation in 2009. 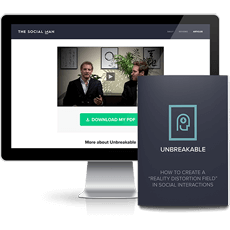 "Take Real Social Dynamic's Foundations and merge it with the Blueprint Decoded. Then add some of the innovations from Venusian Arts' Revelations and Love Systems' Magic Bullets." If you've read and watched these products don't expect any huge revelations. You'll notice many concepts from these which have similar names. Examples from many are RSD's Reticular Activation System (Value Filter) and Love Systems' Emotional Progression model (Emotional Continuum). Caveat. Merging and combining ideas is innovation to an extent. To merge ideas and concepts and make them work together well takes some innovation. So you may get some insights and learn from the way they have pulled this altogether. I found it to be an elegant way to look at dating science. As I mentioned before, it is a well structured product in its simplicity. Where I feel the product WAS innovative was with the aforementioned efforts to bring 'dating science' down to earth and more accessible to the masses. This is the value that Christian Hudson and Nick Sparks brought to the dating advice market with this product. Some of the strengths of this product are how it focuses its approach on dating science. They put a lot of emphasis on emotions, from their emotional continuum concept to just about everything they talk about. This is a really useful and practical perspective which will help a lot of guys. Particularly if you've used a lot of dating advice and are not getting results - this may help to get over this barrier. As a result you will find this to be a lot less of a 'technical/ mechancial' product than Revelations or Magic Bullets. It has a lot less tactics and talks a lot more about basic principles. To build on this they also talk about a lot of subtleties in building connections with people in the last couple of videos. It's these kinds of subtleties that often get students 'brains to click' so they get it. Great to see these here. Finally their advice as to how to learn the game is spot on. They have carefully named some of what people call game as "Super Powers" to emphasize that its the last thing to learn. And not even necessary. I was really glad to see this, because often guys get distracted by a lot of the complex and advanced stuff they don't need to get some better results with women. They cover these in the last video. This is a good grounding programme for beginners. It has everything you need. It will be best for those of you who are good studiers (because there are a fair number of concepts introduced). If you aren't so inclined, other products like the Double Your Dating eBook or the Attraction Code will be better to start off with.